First Line: It wasn't easy, but I was doing my level best to restrain fifty pounds of exuberant wheaten terrier dead set on dashing headlong into the trench at my feet to retrieve the tantalizing collection of bones protruding from the newly turned earth. Immediately after the action in the first book in this series (Single Malt Murder), Abi Logan went off on a photojournalism assignment. Three months later, she's back in Scotland at Abbey Glen, the whisky distillery she inherited. She's wanting rest and relaxation, but it's just not meant to be. Liam, her wheaten terrier, shows too much interest in human bones that have been unearthed during a planned extension on a local business, and she and her distillery have been "volunteered" to host a group of Japanese whisky enthusiasts. Becoming the owner of a flock of sheep is barely a blip on her radar at the end of that particular twenty-four hours. But when she meets her childhood crush-- Rory Hendricks, former hard-rocking lead man of the Rebels-- Abi finds she can't say no to anything the handsome celebrity asks... like photographing his upcoming show or finding out who's trying to kill him. After former band mates have died one right after the other, Rory is convinced that his turn is next, but trying to find a killer amongst such a huge pool of suspects is proving to be a Herculean task for Abi. As you can tell, I've gotten wrapped up with Mullet's characters. I also love the setting, and she is very adept at creating good mysteries. 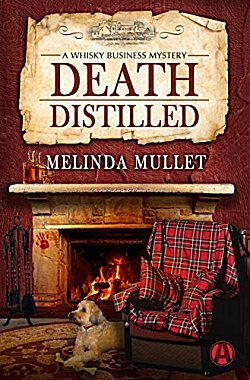 In Death Distilled, readers not only get to try their little grey cells at solving a rock-and-roll mystery, there's also a very good one concerning the village of Balfour and its history. This is a good series that I hope you'll give a try. I know I'm certainly looking forward to book number three!